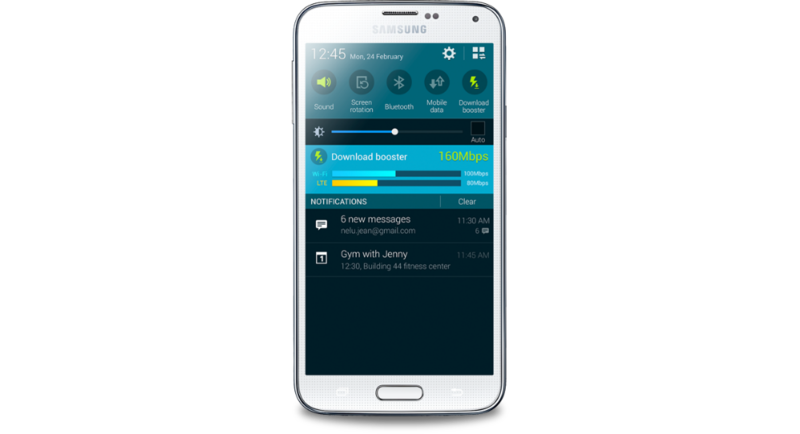 Download Booster on the Galaxy S5 from Samsung was one of the cooler, flagship features introduced on the device. The feature allows users to simultaneously utilize the 4G LTE and WiFi connectivity on the device when downloading files, cutting download times significantly, as advertised on the official Galaxy S5 page from Samsung. Unfortunately, anyone buying the device on AT&T, Verizon, or Sprint won’t find it anywhere on their phones. In an interesting move by these carriers, they have opted to remove the feature, possibly trying to help users save on their capped data plans. Representatives for both Sprint and Verizon confirmed the omission of Download Booster on the GS5, while a few AT&T customers receiving their Galaxy S5 units can confirm that the feature is not present. However, anyone getting the phone from T-Mobile still has reason to smile, as the company has not removed it, even promoting the Download Booster feature on the device. Any users of Verizon may know that a carrier removing features is nothing new, as Verizon was known for removing the Blocking Mode from Samsung devices last year. No exact reason was given by the carriers as to why the move was made, but it does seem rather shady.